CD (ST) Universal. 9819792. 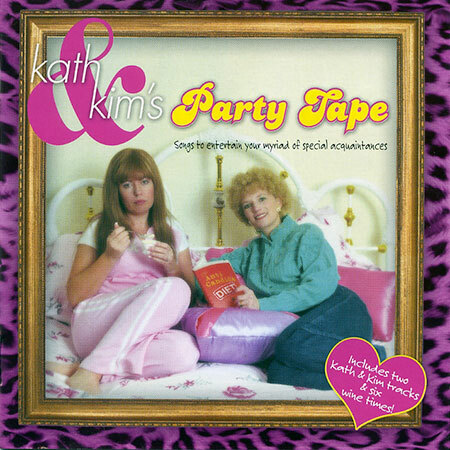 "KATH & KIM'S PARTY TAPE". 2004. 01: The Joker. Gina Riley. 02: Whine Time Intro. Kath & Kim. 03: Don't Touch Me There. The Tubes. 05: Intro Endless Love. Kath & Kim. 06: Endless Love. Diana Ross & Lionel Richie. 07: Roll Over Lay Down. Status Quo. 08: Outro Status Quo. Kath & Kim. 09: Rhythm Of Life. The Supremes. 10: The Hustle. Van McCoy. 11: If I Can't Have You. Yvonne Elliman. 12: Macarthur Park. Donna Summer. 13: Outro Macarthur Park. Kath & Kim. 14: Three Times A Lady. The Commodores. 15: Daytripper. Sergio Mendes & Brasil '66. 16: Intro Sharon It Should Have Been Me. Kath & Kim. 17: It Should Have Been Me. Yvonne Fair. 18: Never Knew Love Like This Before. Stephanie Mills. 19: Generic Royals. Kath & Kim. 20: Love Will Keep Us Together. Captain And Tennille. 21: Lady Bump. Kath & Kim.